When is it acceptable for a mediator to help the parties draft a settlement agreement? This is an issue which occurs to us following the case of Minkin v Landsberg. In this case, the defendant solicitor was instructed to put into an acceptable form the terms of a consent order agreed between the husband and the wife following divorce. The solicitor provided help under legal aid in amending the terms of the order. 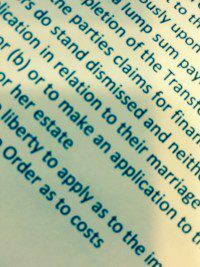 It is now commonplace for the parties to negotiate their own agreements and then to instruct solicitors for limited purposes, such as drawing up a consent order for the court’s approval under section 25 of the Matrimonial Causes Act 1973. Therefore it is now often the case in the matrimonial context that solicitors undertake a limited retainer of this kind. Mediators frequently help the parties by drafting the settlement agreement, although some shy away from it if they can. There is a risk that they could be liable for not advising about the efficacy of the agreement or the consequences of signing it. In low value cases or where the parties are unrepresented it is the norm. Even in high value commercial cases the parties’ representatives will ask the mediator to cast their eye over the agreement. How much is a mediator meant to do to make sure that the agreement reflects and effectuates the parties’ wishes, particularly when they are not represented? This case supports the view that it is possible for a solicitor’s retainer to be limited to simply amending an order and for there to be no duty to give wider advice. Likewise, a mediator should be under no duty to advise as to the terms of an agreement, particularly as he/she must remain independent rather than acting for one party or giving advice. However, we would recommend mediators make it clear in their terms that if they help to draw up the consent order or agreement they will not be liable for the wider implications. A mediator is not a judge but in matrimonial cases the Judge does have to consider the terms of the consent order closely. The court is not a rubber stamp but it exercises an “independent assessment to enable it to discharge its statutory function”. As the Court remarked, the Judge retains its discretion as to whether to approve an order and to make such enquiries as he/she thinks necessary but not to the extent of being a “bloodhound or a ferret”. The Court went on to say that: “It may be thought that an agreement having been reached, the subsequent drafting of the order is a simple enough task – after all, it might be asked, how hard can it be to write down what has been agreed? The answer is “Very hard”. A consent order in financial remedy cases is a complex legal document which must deal with all aspects of the parties’ financial lives now and for the future; many elements of a financial remedy order apply to every case, no matter how modest or substantial the assets may be. An indication of the problems which can arise is found in this case where the divorcing couple are highly educated and used to dealing with technical and complex concepts and documents, and where the husband had legal representation when the proposed consent order was first put before the court. The district judge was nevertheless obliged to reject the proposed order (twice), as, amongst other defects, the debts to be deducted from the proceeds of sale from the former matrimonial home were inadequately identified. The District Judges, more than any other level of the judiciary, are finding their lists are overwhelmed as a consequence of the increase in court time taken by each case where (as is now routinely the case) the parties appear as litigants in person. By analogy, a mediator cannot be held liable for the contents of a settlement agreement save in respect perhaps of any obvious drafting error, particularly where the parties are represented and therefore have the benefit of advice.